This month less is more. There is only one item in January's giveaway but it's a good one! I often get PR emails and most of the time I delete. But I recently got an email with this little guy in it and was in love. I love both horses and driftwood and this piece brings the two together. I emailed the company to see if they'd be interested in gifting the piece for my monthly giveaway, and they said yes! This statue is a heavy carved piece of driftwood in the shape of a horse. It measures roughly 14" x 15". It is SO pretty, especially in person. You can really see the detail. Thank you, Nadeau! The monthly giveaway will be posted on the 1st of every month. If the 1st of the month falls during a weekend, the giveaway will be posted on Monday (like this month!). Again, a big THANK YOU to Nadeau and to you for reading my blog! Good Luck! What a great giveaway! I love it! My favorite animal is my parents bulldog, she has such a fun playful personality. So pretty! My favorite animal is definitely the Owl. I have had this weird fascination with them since I was a kid and own a handful of awesome owl jewlery and home decor items. Looks like it's catching on too bc now they are everywhere! My hubby and I started collecting rhinos on different vacations. We have a cute little collection now. My favorite animal is the dolphin: friendly, intelligent, and traveler of the sea! My favorite is cats. Love the purring. I LOVE horses! I miss riding (competitive dressage) so much! Beautiful statue! Oh... it's a tie. I love elephants and owls. I have tons of both. My love of elephants comes from my grandmother. She had hundreds of them when I was growing up... from all over the world. She would always tell me "an elephant never forgets". My love of owls come from my first and middle initials AL sounding like "owl" when my aunt would say them like the name Al. It was years before I realized she wasn't calling me "owl". Ha. I have such a deep appreciation for all animals it is really hard to pick. I have four cats though so I will go with that. Hard to choose...I'm currently favoring penguins and polar bears. Perhaps because it is winter? Dogs are my favorite animals--especially my Boxer, Layla:) And did you know horses are my second? Favorite animal: Horses...which is why I love this piece! Even if I don't win one, I might get one for myself. My fave animal is the monkey, probably because my mom gave me a stuffed monkey for Christmas when I was 8. He's been with me ever since. This is a great givaway, thanks! What a great giveaway! My favourite animal is a monkey. As a kid I could sit and watch them for hours at the zoo. I would have to say...dogs! Of course it's because I have the most sweet little puppy ever! 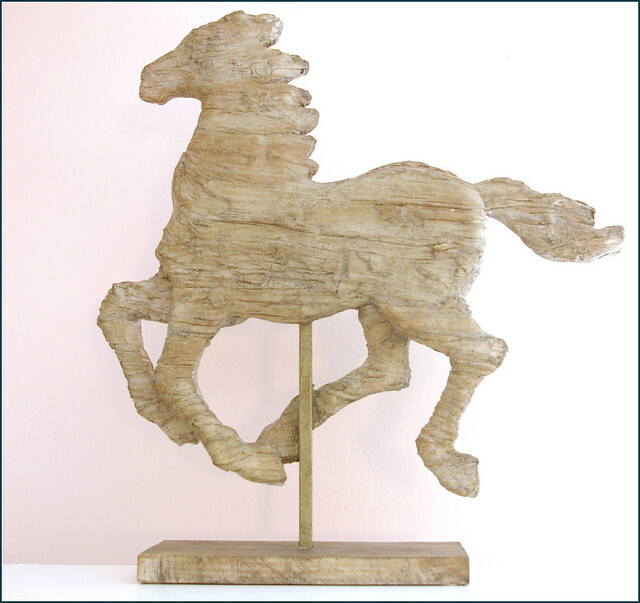 :) I love this piece, love the natural color & as a young girl I adored horses...we had 2! I love elephants! It might be because of the book Water for Elephants- which I looooved! I also want to ride an elephant someday (hopefully on an awesome vacation somewhere ;))! My favorite animal is my white (of course) Pitbull, Milo because he is the sweetest dog we have ever had. But other than him, I love chimpanzees - they make me smile. Elephants. They are so kind, beautiful, and carry their weight with stride dang it. Wow - can I say WOW? This is gorgeous!!! I would love, love to have this for our living room. My favourite animal would have to be a koala. But if I won this I think I'd love horses more! What a beautiful piece! It's stunning. My favorite animal is elephants-- there's something so majestic about them! My favorite animal is also my dog. He is fabulous! I also love birds. Penguins, in great part because my three year old has loved them forever. My favorite animal is the Golden Retriever, in honor of our awesome pup, Scout. After that I would say that I'm kind of obsessed with seeing a moose in the wild! i guess i would have to say cats only because ours is up in NC right now where my sister is kitty sitting for us until we are in a place where we can have cats. Horses - I have been obsessed with them since I could walk! Also, ducks - they crack me up all of the time! Owls! I just love them and they work in decor for every age. Hard to say. Intrigued by the beauty and delicacy of giraffes! But I do love a dog, especially a lab! Thanks for the opportunity to win your awesome giveaway! My favorite animal would have to be a dog. I'm the idiot at parties who ignores the host and plays with their dog. My favorite animals are DUCKS! I just love them! My favorite activity is to go feed the ducks at the park! I would have to say my favorite animal is our Boxer, Cali, but I love horses, too. I used to ride them when I was a young girl. Birds are my favorite. We feed lots of birds all year long and I love to watch them. I love flamingos because they are pink and tacky and they make me smile. I would have to say that my favorite animals are dogs. My Macy girl makes my day! Although in middle school I always dreamed of owning a monkey! I love bears because I am secretly envious of their "hibernation"...sometimes I wish I could hide out and relax! I love wallabees! I've always wanted to go to Australia and smuggle one home with me ha! My fave is a standard poodle. They are so smart and fun to be around. (second post for blog reference) I posted the information regarding your giveaway on my blog! I would just die if I won this horse, he is seriously too cool! Actually, my favorite animals are horses! I am from Kentucky, which is horse country, and I love love love going to the barns at Churchill Downs and Keeneland with my dad to visit the horses :) So this giveaway is perfect for me! I love elephants. baby elephants to be specific. But the horse is just beautiful! fingers crossed! I absolutely love kittens! They're too cute! We love horses around here, I married into a family of cowboys, this would be perfect in our home! Horses!! I took riding lessons growing up and loved it! Well, I have three dogs and three cats, and if I choose one species over the other there may be an unpleasant canine/feline uprising within the household. I'll be extremely diplomatic and say that I love all animals, but the ones in my home are the closest to my heart. Dogs are my favorite, they're so friendly and cuddly! Dogs! For sure, my favorite animal. I love elephants, they're intelligent and gentle, but can be fierce if need be. Oh my goodness that's adorable. I actually collect horse figurines too. OK, that's a lie I only have one horse figurine, but if I win this would officially become a collection. Favorite animal? Definitely my little black pug. But horses are cool too.